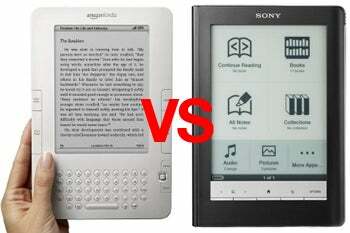 Sony introduced today two new e-book readers to compete with Amazon's Kindle series. But do they really have the potential to outsell Amazon's hot device? 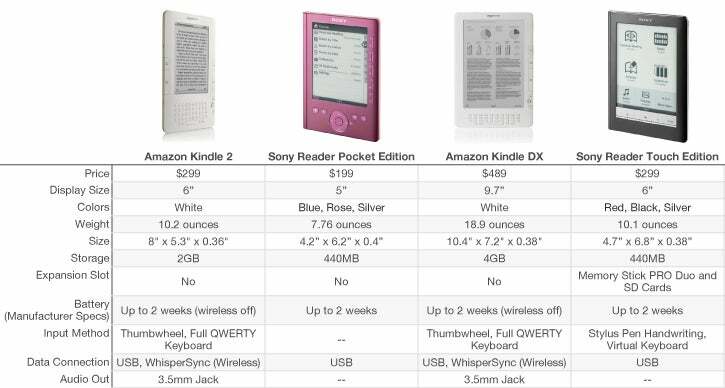 Have a look at the chart I put together, which compares the basic specs of Sony's and Amazon's e-book reader offerings, and read on for more commentary. Sony's new "Pocket Edition" and "Touch Edition" e-book readers are the second wave of devices coming from the Japanese company to tackle the Kindle. Only this time, they are more aggressively priced: a Pocket Edition Sony Reader (PRS-300) will cost $199 when it goes on sale on August 25 -- a whole $100 cheaper than Amazon's Kindle 2. Sony's PRS-300 has a smaller screen than the Kindle 2 -- only 5 inches. Sony's Pocket Edition reader is also lighter, but as a major downside, it only features 440MB of storage. Sony says that will be enough for 350 e-books. But that is still a lot less than Kindle 2's 2GB of storage (4GB on the Kindle DX), enough for about 1500 books (3500 books on the Kindle DX). Sony however, will launch another e-book reader next to the Pocket Edition, called Touch Edition (PRS-600) -- priced on par with the Kindle 2 -- for $299. The Sony Reader Touch Edition will feature a 6-inch screen but with the same low amount of on-board storage as the PRS-300. Only that the Touch Edition Sony Reader will support Memory Stick Pro Duo cards from Sony and SD cards for memory expansion. Sony claims a two-week battery life for both of its upcoming e-book readers, a number the par with Amazon's claims for the Kindle 2 and Kindle DX (with wireless turned off). But, yes, Amazon's e-book readers still claim supremacy when it comes to downloading books wirelessly, thanks to the Whispersync service. Sony's new readers use only USB to download books, but the company is rumored to launch a reader with this feature in the near future as well. A cool feature on the Sony Reader Touch Edition, as the name says, is the touchscreen panel, which would eliminate the need of a full physical keyboard as present on the Kindle. The Touch Edition from Sony lets users turn pages by swiping their fingers and also features a virtual keyboard for touch input. A stylus comes with the Touch edition, which can be used either for handwriting notes on the reader or with the virtual keyboard provided. Sony has now matched Amazon's price for new releaser and best sellers, now $9.99 (down from $11.99). Sony also has a partnership with Google, which has released 1 million public domain books (free) for the company's e-book readers. Meanwhile, Amazon hasn't made publicly available the number of Kindle devices it has sold since their launch in 2007. Some estimates put this number at around 1.5 million, but still, the company must be feeling the competitors' pinch, as last month Amazon dropped $60 off the price of the Kindle 2, now priced at $299.